This book is also available as a hard-back here. The book describes a story of development of the idea of spiral nature of the universe that embraced the best minds of humanity since ancient times. In our millennium, this idea was advanced by several distinguished scientists, among them Johannes Kepler, Rene Descartes, and Gottfried Wilhelm Leibniz. It eventually became a major challenge to the physics of Newton. 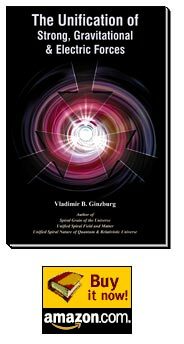 The book is written in the form of a story that begins from Archimedes time and describes how the spiral field theory could have been developed. The story is one of scientific and historical facts, enlarged by imagination with a small dose of conjecture. "Big ideas can have humble origins, Vladimir Ginzburg's new physics of Newton and Einstein began with a single crum of bread. 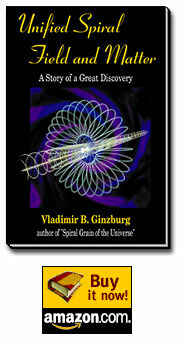 Then this idea found their way into his novel "Spiral Grain of the Universe: In Search of the Archimedes File," a tale that adroity entwines scientific fact and fiction to introduce the author's controversial toroidal spiral field theory as the way of describing the infinite nature of the universe." 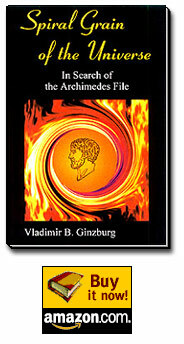 This book expands a story of the Archimedes File described in the earlier published book Spiral Grain of the Universe - In Search of the Archimedes File. It briefly outlines a story contained in the previous book, and then continuous the story and describes the contributions made to the science by several distinguished scientists of the 18th and 19th centuries, including Emanuel Swedenborg, Leonhard Euler, Rudjier Bo?kovi?, Michael Faraday, Andre-Marie Ampere, William Thomson (Lord Kelvin), James Maxwell, Heinrich Hertz, and J.J. Thomson. Outlining a road map to a unified field theory.